In the first risk/reward article, we saw that if we take an income-centric definition of risk and reward, solid equity exposure would have been beneficial for a US-located retiree. Two conditions were necessary though, the disciplined use of a sound variable withdrawal method, and the acceptance of some level of emotional risk due to portfolio drawdowns. We shouldn’t forget that the US clearly benefitted from a strong history in the past ~100 years when it comes to stock returns. There is no guarantee that this will keep going, and in other developed countries, the history of the stock market has been quite different. It is therefore interesting to use the same tools (e.g. 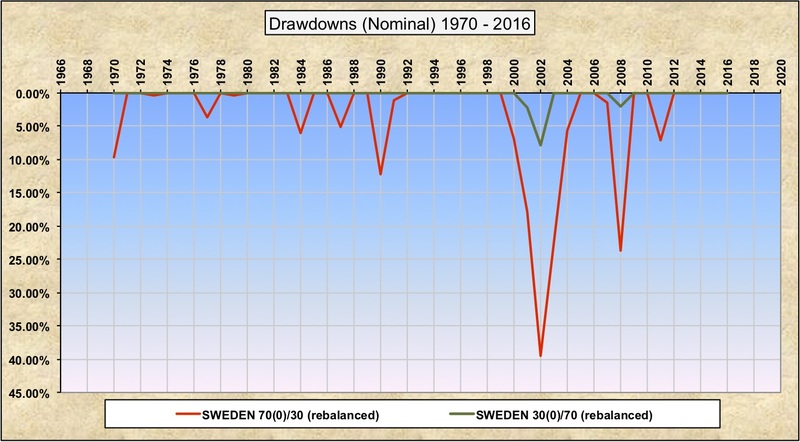 SWR and drawdowns analysis) and see what would have happened, an ‘out-of-sample’ test of sorts. The author published in the past a study (‘investing with the world’) looking at global and domestic investing from the perspective of local investors (e.g. if you were located in Spain or Japan or Sweden, how did it go if you used various types of asset allocation, with more or less of a home country bias?). 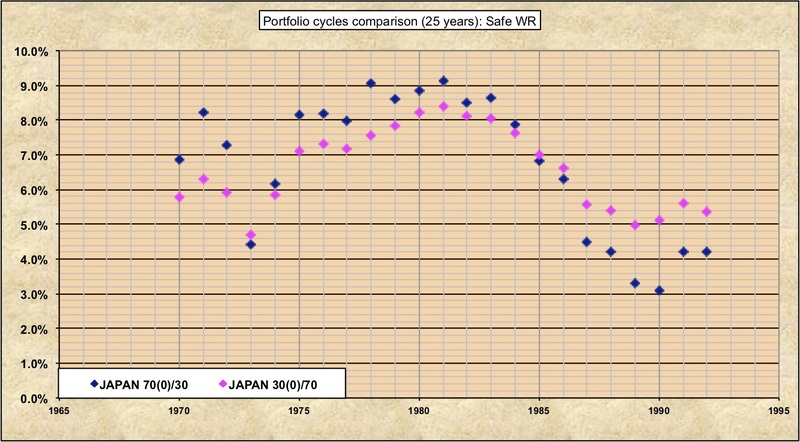 the asset price crisis in Japan started in the late 80s, hence less than 30 years to go to 2016.
comparing 25 years charts with corresponding 30 years charts showed very similar patterns (except for the 5 starting years being added, of course). A crucial point which noticeably separates the various countries is that inflation trajectories have been quite different The severe issues faced by Spain and Italy, as we’ll see later, were partly caused by severe inflation. In some cases, the vagaries of exchange rates also had quite an impact, most notably in Japan. The ‘investing with the world’ study elaborated at length on those considerations. For ease of comparison, and to better illustrate the true consequences of local inflation and exchange rate risks, all the charts below are expressed in local currencies. 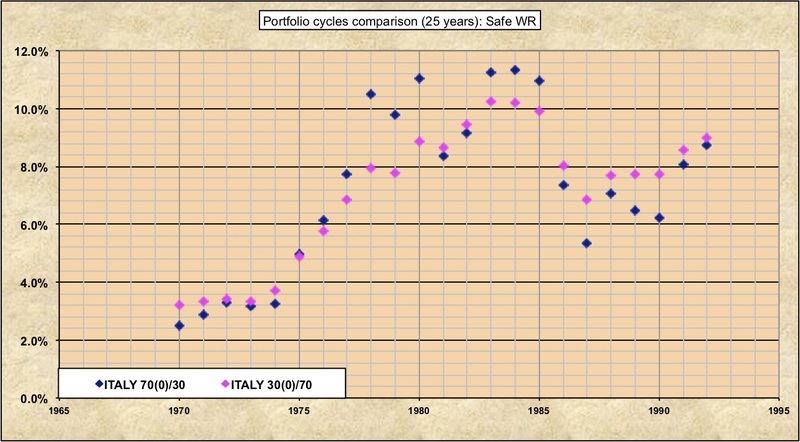 The SWR charts are expressed in real terms (by definition) and the drawdown charts are expressed in nominal terms, to better capture the emotional risk. 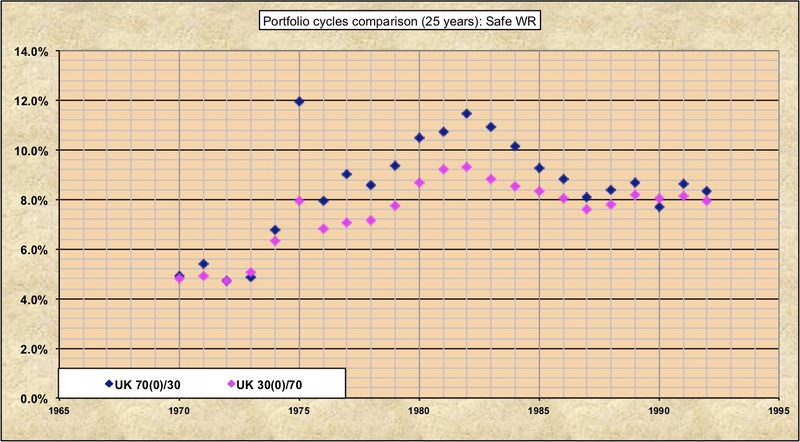 As we have seen in the first risk/reward article, the SWR analysis provided remarkably consistent results across cycles, showing that a 70/30 asset allocation would have performed better than a 50/50 allocation, itself better than a 30/70. Here is the same type of analysis for the US, starting in 1970, with 25 years retirement periods. Yes, the 1973 data point for 70/30 is slightly inferior than its 30/70 counterpart, but the difference is small, and extending to 30 years periods basically makes them equal. A 50/50 test would show similar results. Here is the corresponding drawdown chart, expressed in nominal terms. The US retiree would have had to endure relatively short-lived drawdowns of 20% to 25%, when electing to go for a 70/30 asset allocation. Let’s switch to the UK. The SWR pattern is quite similar, a strong equity exposure would have been either neutral or helpful. 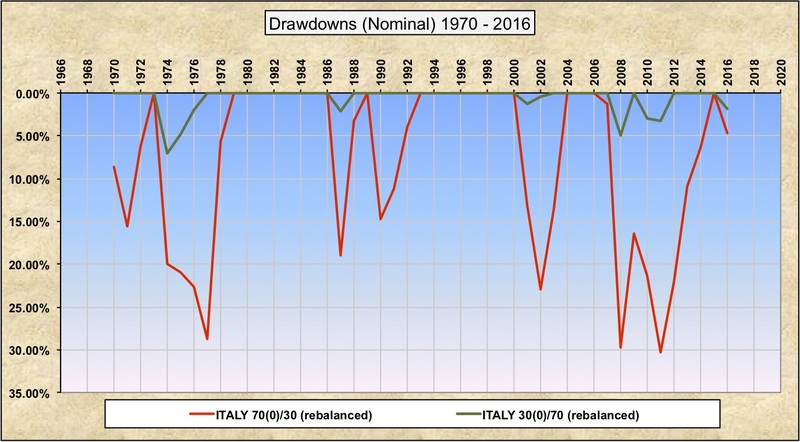 The recent drawdowns were a bit less severe, while the oil crisis triggered quite a (short-lived) drop. 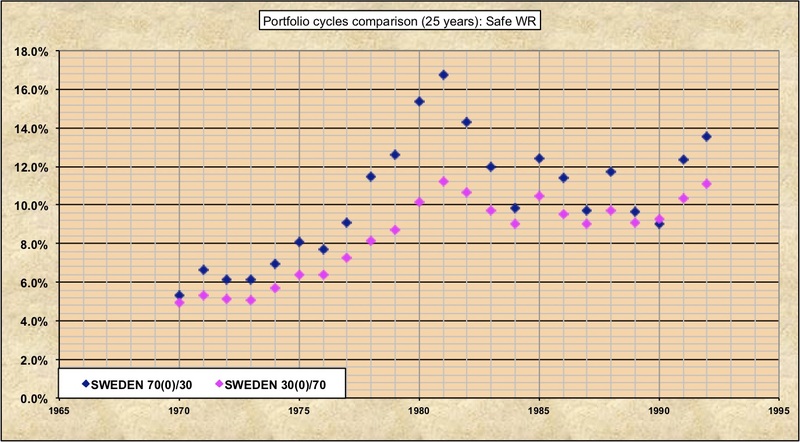 Finally, just for kicks, we can look at the best performer during this 1970+ timeframe, Sweden. Lucky folks, except for a severe scare during the Internet crisis. Multiple countries displayed patterns somewhat similar to the US and the UK. At the bottom of the stack though, we have two very troublesome cases, Spain and Italy, which suffered from inflation higher than 6% (geometric average) between 1970 and 2016. Unfortunately, interest rates aren’t available for Spain in the early 70s, so we’ll focus on Italy. 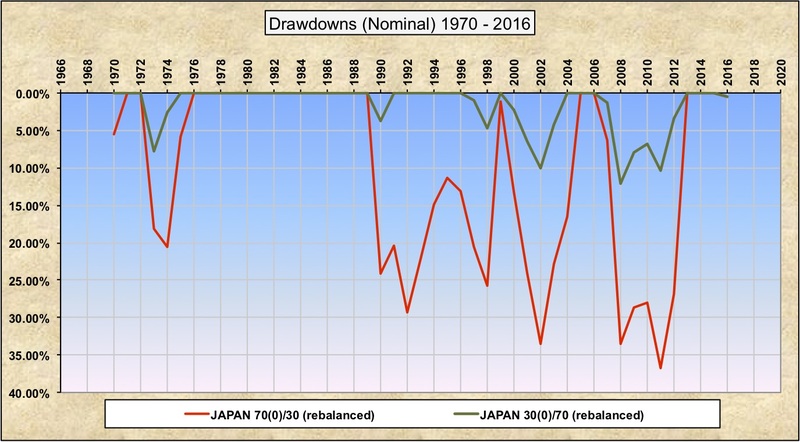 To set the stage, let’s start by the drawdown chart in nominal terms. Remember that at this stage of analysis, the portfolios are entirely domestic (stocks and bonds). The stock-heavy retiree would have to go through quite a roller-coaster. In this case, given the raging inflation in the 70s and 80s, the nominal perspective is actually hiding the real troubles. Here is the same drawdown chart in inflation-adjusted terms. Note how the scale of the vertical axis changed. This is downright frightening. Whether the portfolio was heavy on stocks or bonds didn’t make a ton of difference (in real terms), an investor would have gone through TWENTY years of absolute misery, triggered by the oil crisis. And those drawdown charts do not even account for withdrawals, this only depicts the trajectory of a fixed amount of capital invested at the beginning. Furthermore, Italy has been back in the lurch in the past decade, and who knows when they’ll go out of it. 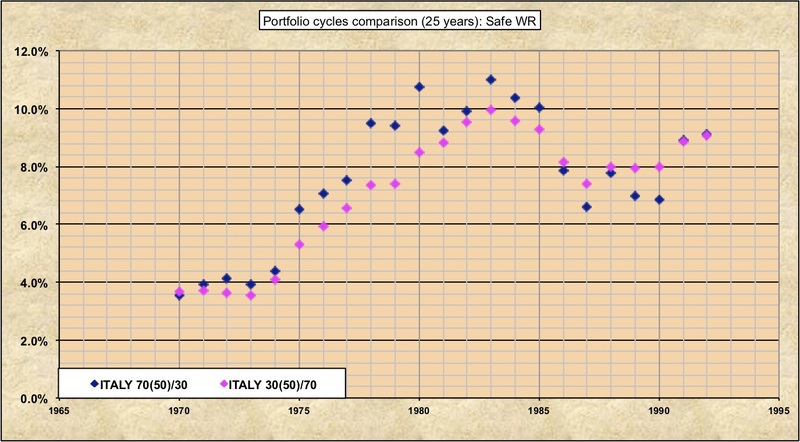 Now, let’s look at the SWR chart for our usual 70/30 and 30/70 domestic portfolios. Not pretty, to say the least. SWRs around 3% with a bonds-heavy portfolio, down to 2.5% with a stock-heavy portfolio, this would have been extremely challenging, income-wise, for most retirees. A quick test using 30-years retirement periods ended up with similar results. Clearly, neither domestic bonds nor stocks would have saved the day. What about maximizing diversification though? What if those retirees had split their stocks evenly between a domestic index fund and a worldwide index fund (which includes their home country at market weight)? Let’s check Italy again based on such assumptions. The most troublesome SWRs went up, close to 4%. And we’re (mostly) back to a familiar pattern where more stock exposure did not really help nor hurt for the worst retirement cycles, but provided some extra income for rosier starting years (to the exception of the late 80s though). Diversification played its magic, once again. 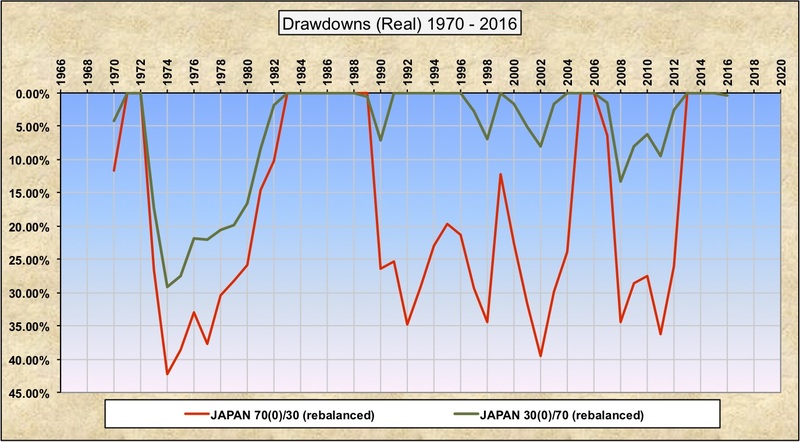 As to drawdowns and emotional risk, the improvement of such approach was clear as well. Exact numbers aren’t available for Spain, but running some tests with approximate numbers seems to indicate that the situation was even more dire, and that diversification would have helped in a similar manner, although to a lesser extent. Note that for the countries which did the best in this time period (e.g. US, UK, Sweden, etc), diversifying could have leveled off the rosier outcomes, but not by much. And of course, one couldn’t have known in hindsight if one’s country would have done well or not. The wisdom of hedging bets will not make you win the lottery, but remains the best course of action. All developed countries went through similar crises, the oil crisis in the 70s, and more recently the Internet and Financial crises. The level of pain and the ease of recovery varied, but the top-level patterns were quite correlated. 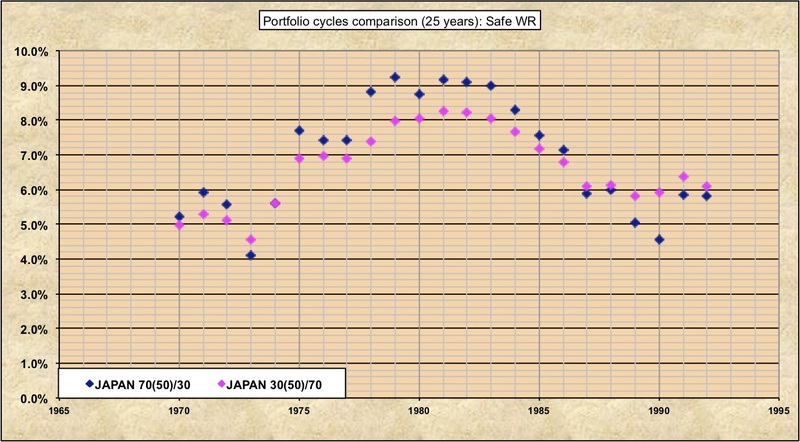 Japan’s trajectory was squarely different. 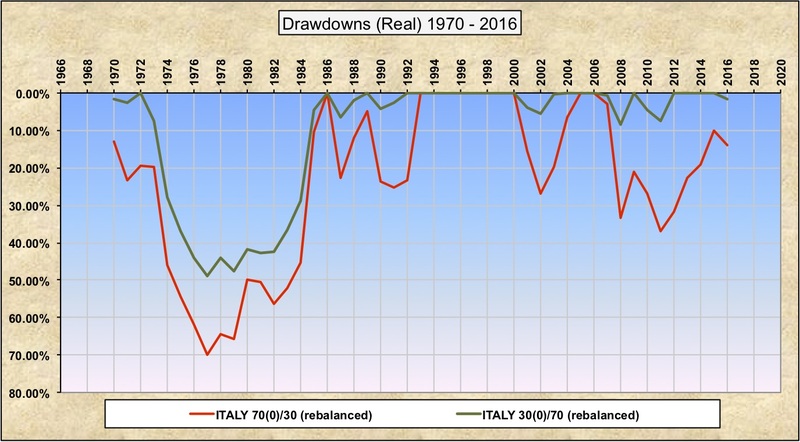 Let’s look at drawdowns first, in nominal terms, then in real terms. Similar to other countries, the oil crisis proved quite painful, but then, at the end of the 80s, the asset bubble crisis struck Japan extremely hard, reverberating for a couple of decades, and then the financial crisis added insult to injury. 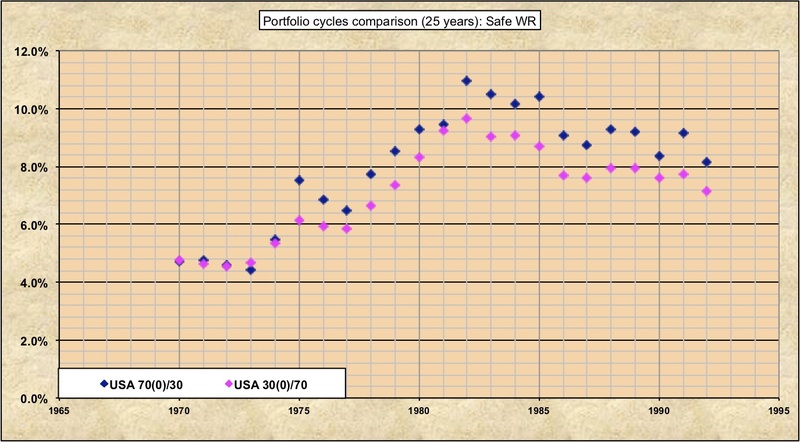 Here is the corresponding SWR chart, which basically conveys the same message, domestic stocks were truly toxic by the late 80s.In this very unique case, a high exposure to bonds would have been very beneficial. The issue is probably a little overblown, as this neglects to take in account the unprecedented bull market that preceded the fall, and because pension systems are very strong in Japan, but still this is sobering. What about the magic bullet of diversification? Let’s evenly split equities between Japan and a World index (see below). There is clear progress, we’re back with SWR numbers above 4%, and actually going up rather nicely compared to the domestic-only allocation. Drawdowns are also significantly less traumatic. This is largely due to the trajectory of exchange rates during this time period, a silver lining for Japanese investors. This use case did erode the pattern that high and diversified stock exposure nearly always provided superior SWR results though. One can find other exceptions with a couple of other countries (e.g. Austria, Denmark), albeit much less dramatically than Japan. Still, any rule has exceptions with the stock market, and full diversification did prove singularly effective to mitigate the worst stock market crisis in modern history. The examples of Italy, Spain and Japan remain disturbing, demonstrating among other things that inflation risk really cannot be neglected in modern times. The evidence appears quite strong that even in those countries, the conclusion would have held to a large extent, mitigating disaster while proving beneficial in most other cases.